On August 24, 2011, astronomers from the Palomar Transient Factory project announced the detection of a supernova in the nearby galaxy M101 (NGC 5457). The transient, initially dubbed "PTF11kly", was initially observed around magnitude 17.2, but has since risen very quickly. Observers from around the world, amateur and professional alike, began observing this field, and it was soon confirmed as a supernova and given the official designation "SN 2011fe". This new Type Ia supernova is now one of the brightest supernovae visible from Earth in the last 20 years, and promises to be a treat to both visual and instrumental observers for the remainder of 2011 and beyond! Type Ia supernovae are formed from the collapse of a white dwarf star in pairs of closely orbiting stars known as cataclysmic variables. When a white dwarf collects enough matter from its companion to reach a critical mass of 1.4 times the mass of the Sun -- the Chandrasekhar Limit -- it will collapse in on itself and then explode with tremendous power, becoming visible across the entire universe. Supernovae of this type are cosmologically important because they can be used to calibrate the distances to galaxies where they occur. All Type Ia supernovae are believed to reach similar peak brightesses, and the measurement of this peak is an important way to calibrate distances to galaxies measured by other means (such as redshift). By finding and measuring Type Ia supernovae, we can measure the size and structure of the Universe that we live in. Bright supernovae occur infrequently, and it's rare for a supernova to become as bright as this one. The last comparably bright supernova of any type was SN 1993J, a Type II supernova which reached magnitude 10.0, while the last comparably bright Type Ia was SN 1972E which reached magnitude 8.5 nearly forty years ago! The supernova is bright because it's relatively close to us. Its host galaxy, the beautiful spiral M101 (also known as the Pinwheel Galaxy), is "only" about 20 million light years from us -- right in our cosmic backyard compared to the distances of most other galaxies in the universe. SN 2011fe will provide the amateur astronomical community a great opportunity to participate in important science, and we encourage everyone to observe SN 2011fe over the coming days, weeks, and months! SN 2011fe is located in the bright spiral galaxy M101. It is well separated from the brightest parts of the galaxy, and both visual estimates and instrumental photometry should be straightforward. This region of the sky will be challenging to observe within the next few months if you're observing in the evening, but you can still obtain observations in the early morning, pre-dawn hours. The AAVSO has a comparison star sequence suitable for both visual observers and CCD and DSLR imagers. You can create your own customized charts of the field using the AAVSO's chart plotting tool, VSP. You can also submit observations to the AAVSO using our WebObs tool, just as you would any other variable star. 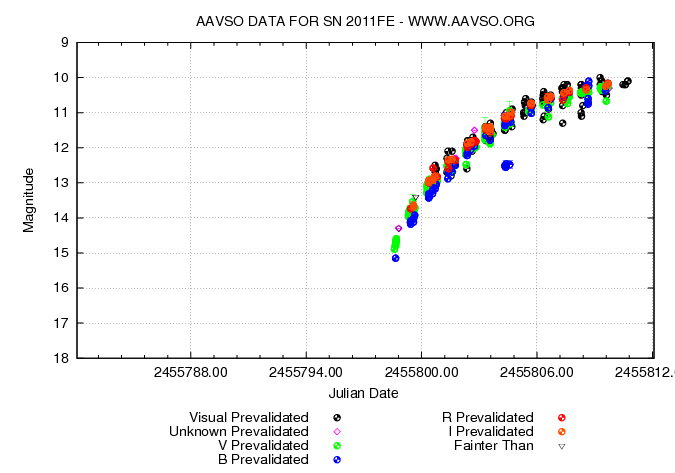 Please use the name "SN 2011fe" to submit data or prepare your own charts. If you have data to report but you're new to the AAVSO and haven't yet submitted data to us, please go to our "For Observers" page, and follow the link to "Request AAVSO Observer Code". From there, you'll have your own unique identifier code that will allow you to submit observations. If you're a novice observer, please browse the For Observers page and learn more about how you can observe variable stars and contribute observations of this supernova and other variable stars. You can also participate in a new online forum about this supernova, asking questions and sharing experiences and expertise with other observers. Go to our Forum: Supernovae Photometry for more information and to participate. It's open to everyone -- amateur and professional, novice or experienced observers alike -- so please join in!